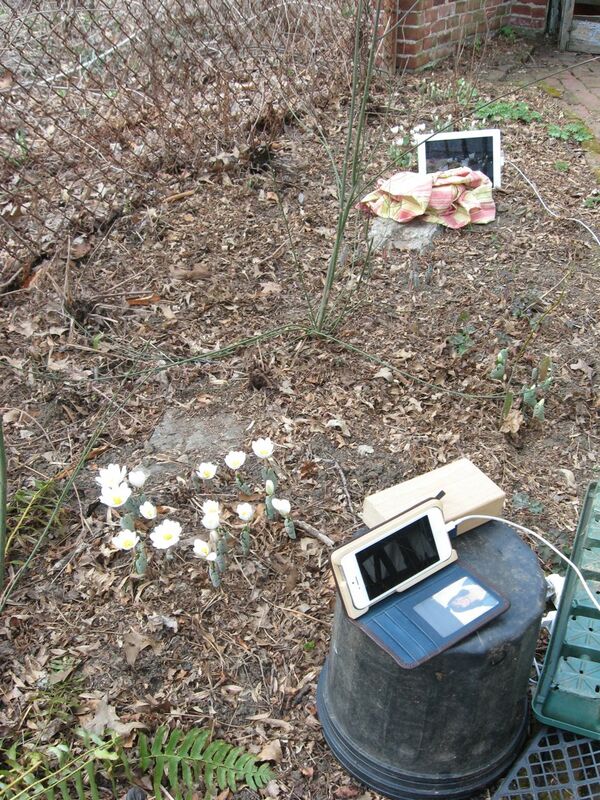 THE IPOD TOUCH WAS SET UP TO VIEW THE BLUEBELL PATCH IN THE SIDE GARDEN ADJACENT TO MORRIS PARK. THE BLUEBELLS GREW AND BLOOMED, WENT TO SEED AND DESCENDED BACK INTO THE EARTH AS THE COLUMBINES AND GERANIUMS ROSE TO PROMINENCE. WATCH THIS ALL PLAY ITSELF OUT IN HIGH SPEED MOTION WHERE TWO MONTH’S TIME HAS BEEN COMPRESSED INTO 3 MINUTES! As the video reaches its last minute, pay attention to the lower right hand area, where you will see the Jack-In-The -Pulpit rise out of the Earth from its bulb in a rapid fashion and spread its leaves and bloom in a quickened pace compared to the other plants. Interesting how bulbs grow in relation to non-bulbous plants. 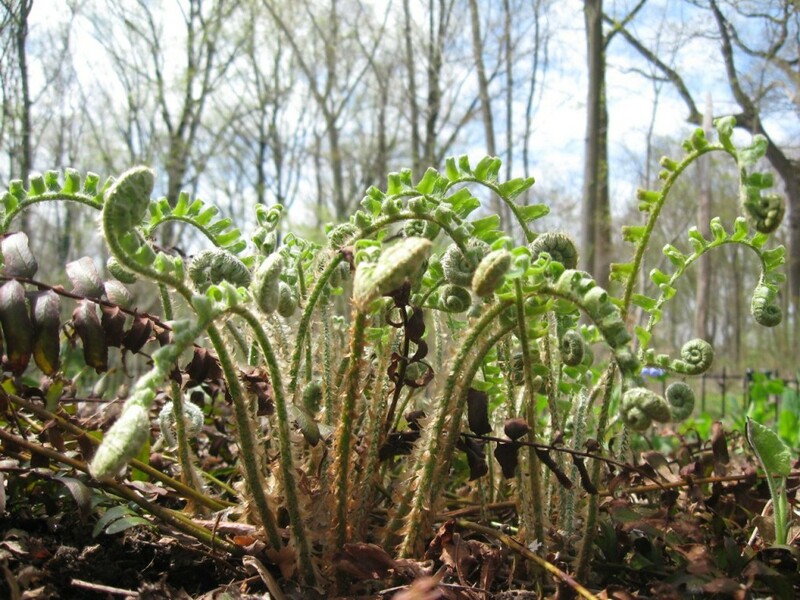 The Ostrich ferns are also interesting to watch unfurl and rise up. Yes, one of them was removed and transplanted. At the very end of the video a Clematis vine is swinging itself into the picture, looking for something to grab onto. 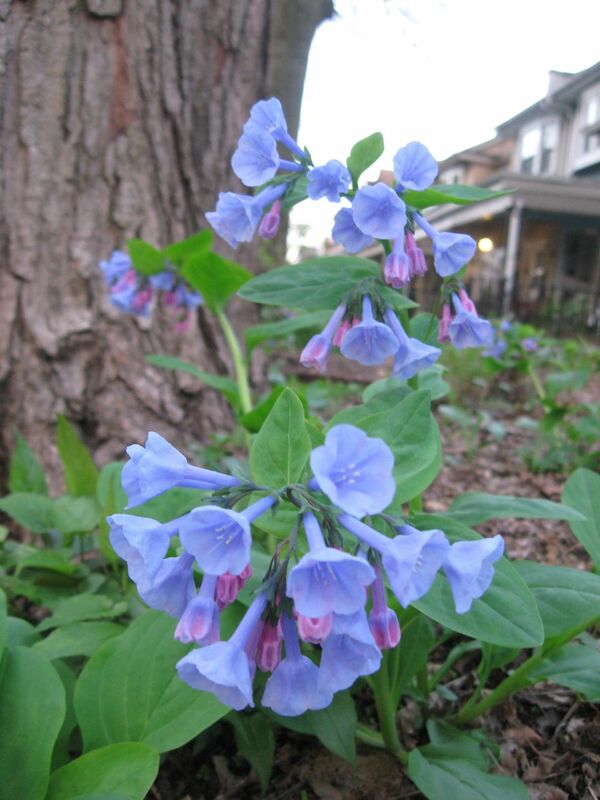 The original intention of the video was to document the rise and blooming of the Bluebells (Mertensia virginica). After they lost their flowers, the scene was unfolding in such an interesting manner that we decided to let the camera keep rolling. Other plants that are featured in the video that you can keep an eye out for are Wild Ginger, (Asarum canadense) Lonicera sempervirens, The Coral honeysuckle and Mayapple, (Podophyllum peltatum). For those interested in the process, we used the O-Snap App and had the Ipod take a picture every twenty minutes for the first 40 days and then every two hours after that. The night pictures were deleted because they distracted from the story of the plant’s progression and continuity of the video. Before Spring begins remember that every Spring is different from the last so it makes it difficult to plan for a perfect spring day. That is why it is important to take a Spring Vacation, hopefully one of those days will be that one day we were waiting for, when the weather is balmy and wildflowers are blooming, and we are there to enjoy it. In every region, this Springtime happens at different times of the year, here in Morris Park, Philadelphia, it happens from late March into early May. 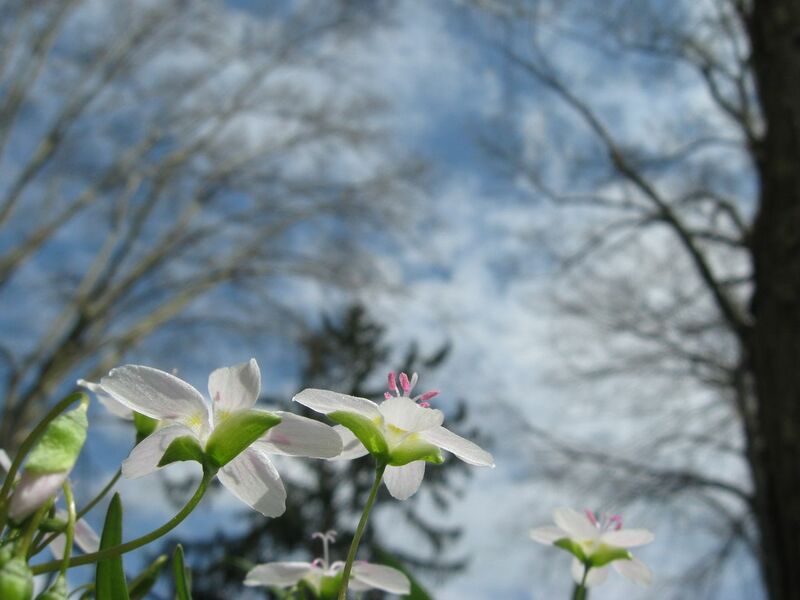 In the Southeastern Pennsylvania region, April is the special Spring month, mark your calendars! However, before Spring begins, we must experience our winter. We have been seeing a lot of different types of snow, from dry and fluffy to wet and heavy. Some windy storms, drifting and dramatic, to just a heavy fall, creating a quiet cold and white world. And then the ice storms and the old snows crystallizing, becoming architectural and difficult to transect. Winter becomes increasingly wearisome and monotonous, the cold, the darkness, the ice, the dirty snow piles and the daily slush. Before winter ends, we must do our best to embrace the beauty of even the most challenging conditions, starting with the skies and the winter light-that low sun-how generous it really is to the barren landscape. The old city, with dirty piles of snow and aged buildings is most often basking in a winter’s glow, a light that is kind upon the decrepit brick piles and worn architectural profiles. Upon the Forest remnants of the city, along with the open parklands, the winter’s sun explores the landscape for us, allowing ours eyes to stretch the distances and see the land before us, the hills and valleys, the details of the topography, the erosion of the landscape along with its deposition, the floodplains and streambeds, the broad rivers, and the vast expanses of flat lands of the coastal plain. The barren lands exposed before us in the winter’s glow undulate with old eroded hills and grand valleys that span thousands of winter’s time. We can look at the land in the winter, and see the hills. With the ground exposed, there are rocks. And when the snow cover becomes more permanent, the hillsides, clothed in white, reflect an atmosphere that is quintessentially winter, white hillsides, sometimes glistening in the low winter sun, and sometimes barriers to the sunlight, becoming heavy monuments to winter’s dominance in the landscape and the time. Before winter ends we gain so much aesthetic fulfillment from our appreciation of the trees. Each specimen like an x-ray of itself, the trees lay bare for so many months, like skeletons, except that these are common enough skeletal forms, a good part of the year they are exposed in silhouette, creating an elegant backdrop to the winter season. This is indeed the time to study and enjoy the shape of the trees, to see the inherent patterns of the growth forms, because each species is so distinctive, after awhile, we can distinguish the types of trees from their winter silhouettes, and this is a fun habit and exercise! These silhouetted landscapes of the winter and the beauty they convey to us, after our own needs are met, provide a sublime beauty, one that we want to embrace and share, to paint and ink, to photograph and relate poetically, the winter forest is that accessible and enchanting, the raw forms of life and shapes, and the stark contrasts of colors, the winter-scape is a silhouette we can grasp and appreciate. Learning a language is enlightening enough, try learning the language of the trees in our forests; there is that one day when we start to see the exquisite results of our efforts at learning, and we can distinguish them, and the forest is new to us again! The trees have a universal language of shape and habit, and once we recognize them we can see them everywhere, on the city streets, on lawns, cemeteries, parks and in the forests alongside the road, the trees become ours as we distinguish them and begin to understand them, their habits, habitats, forms and limitations. To see them in winter is so dramatic, because we can really comprehend their growth form and structure, we can appreciate the structure before Spring begins. Seeing a bare forest in the winter is mesmerizing because of its intricacy and raw beauty, with the trees lined up, side-by-side and intermingled, jumbled, the endless branches, twigs, trunks, all of them silhouetted in the winter’s sun, there within we see the beauty of the trees, the winter forest, the winter sun’s light, our eyes can stretch into the landscape, beyond our imaginations, just what we need in the cold relentless winter. Into the landscape and beyond, through that stand of trees caught beautifully in the sunlight, beyond into the sky, past the farm fields and subdivisions, highways and strip-malls, and best of all, the preserved lands and the forgotten ones, we must continue to stretch our vision into and through these forests of continually growing trees. If we keep looking, we will see Spring burst forth eventually from these isolated stands of silhouetted trees, area by area and spot by spot, and below them, we will see the flowers bloom. The sky changes, and the world moves into a different light. Moving right along, it is indeed movie time, all of winter in one minute! So the Ipod touch was set up on a tripod in the Living room window facing the forest-land of Morris Park. This device was in dedicated service with this project and could not be used for anything else. the O-Snap app was used which is very good for time-lapse photography. The app was adjusted to have the camera take a picture every two hours. the night shots were deleted manually, ending with 385 pictures. Take note of the numerous snowfalls exhibited and also notice how the setting sun moves from the left to the right as the axis of the earth changes in relation to it and it sets further and further north on a daily basis. Also the tripod was bumped a few times very slightly altering the video by Nuage the cat who took great interest in the birds visiting the bird-feeder just outside the window. Nuage the cat took great interest in the birds just outside the window. A pair of Mourning Doves loved to rest on the window sill. 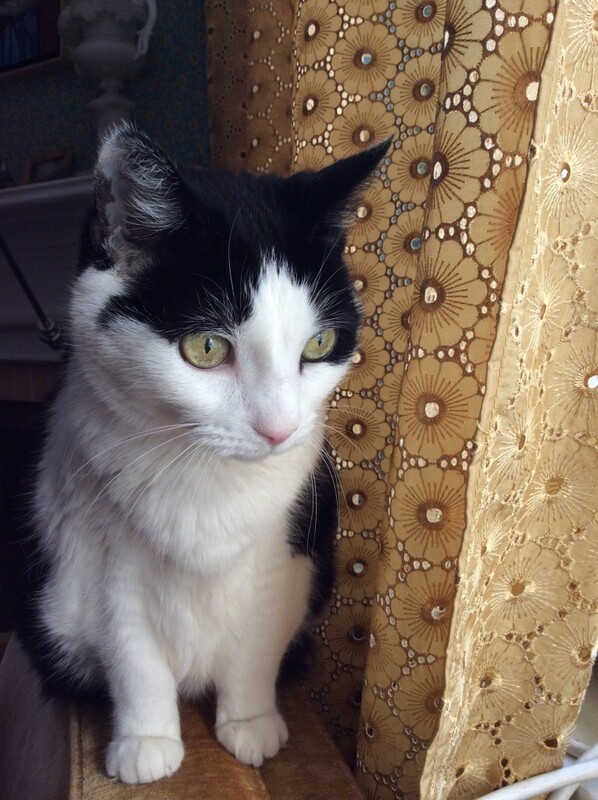 Here she is next to the tripod staring at the birds. By having the birdfeeder and the Ipod on the tripod , not to mention the beautiful forest just outside the window kept us very entertained throughout the long dreary winter days. Enjoy the Video and Happy Spring! CLICK ON THE LINK BELOW TO EXPERIENCE WINTER IN ONE MINUTE! Spring 2013 is quickly wrapping up as the solstice approaches. Post Memorial Day has a summer feel in some respects, but it is still the very end of Spring. The trees have a fresh, lush, green and the Tulip Poplars are still flowering here in Philadelphia. The Bloodroot is just now letting out its seed, with their pouches bursting open, full of ripe brown seeds, ready to be carried off by the ants. 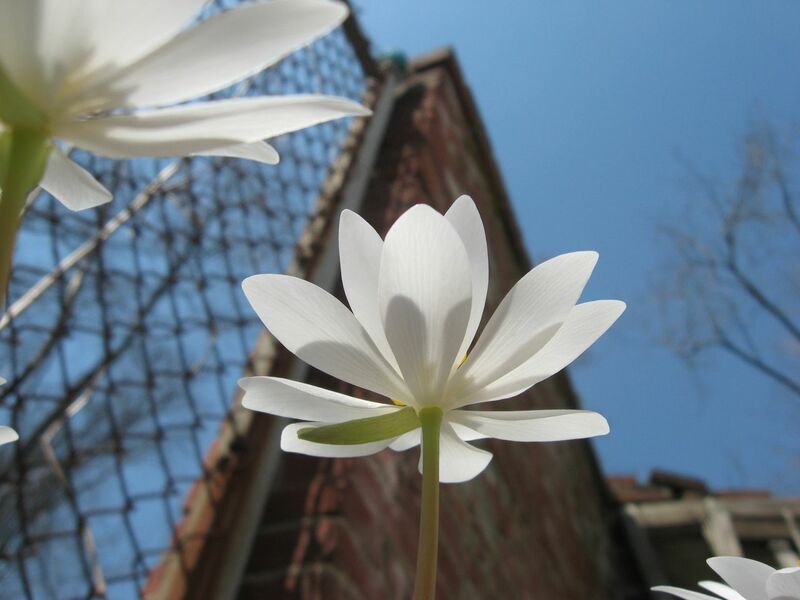 We are presenting a retrospective of Spring in our Garden, starting with the flowering Bloodroot. 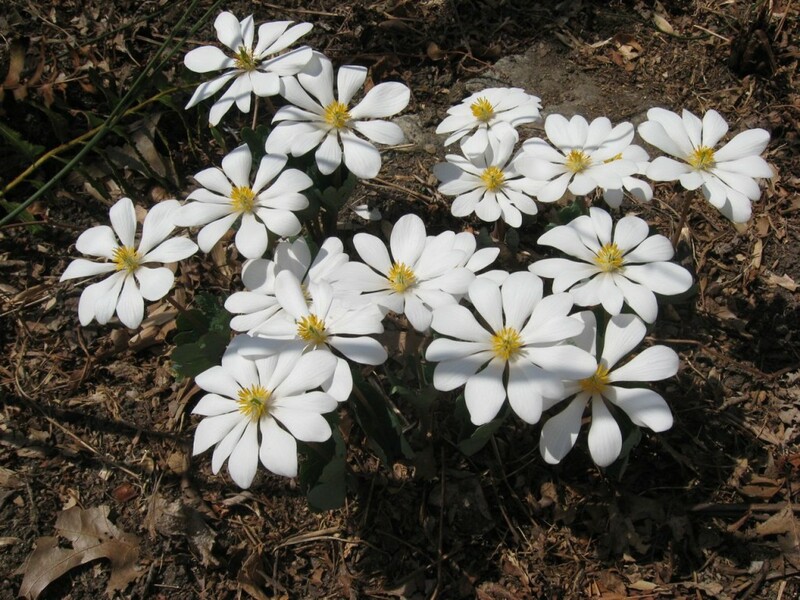 Bloodroot opens up with a refreshing, diverse array of delicate white flowers in the early Spring afternoon. Bloodroot creates a joyous and exciting start to the season. We decided to try to capture the blooms in a time-lapse video. 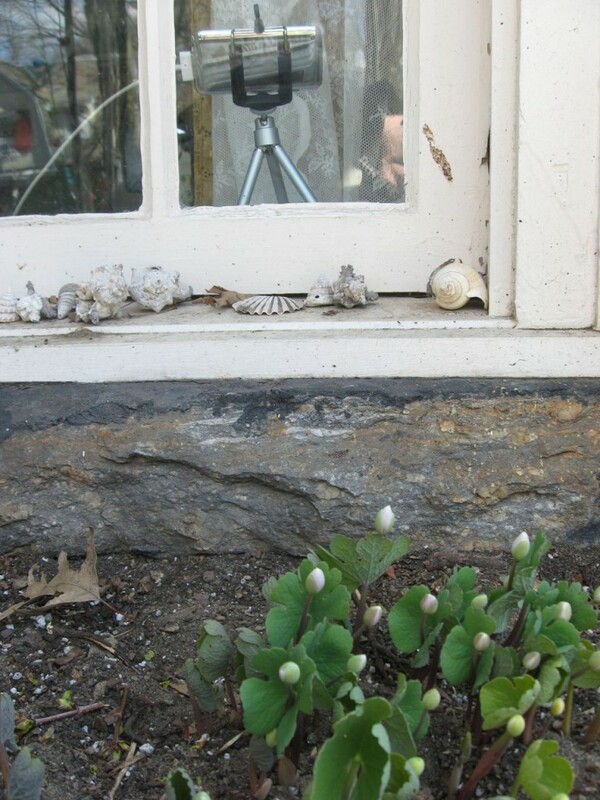 The Ipod Touch became a dedicated camera for over two weeks as we made a time-lapse video of the Bloodroot flowers growing and blooming. Most essential was to have the device inside the house, and up against a window, with a planter box where we have bloodroot growing, so the protected device was only about one foot away from the plants. The intervals of photographs were based on prior years observations of this plant’s flowering habits and some calculated risk based on these observations and the weather conditions. Basically, to get a blooming flower in a video, there must be a sunny afternoon (the flowering is generally not a morning event), above 50 degrees with a full bud on the emerged plant, right around the Spring equinox in Philadelphia. 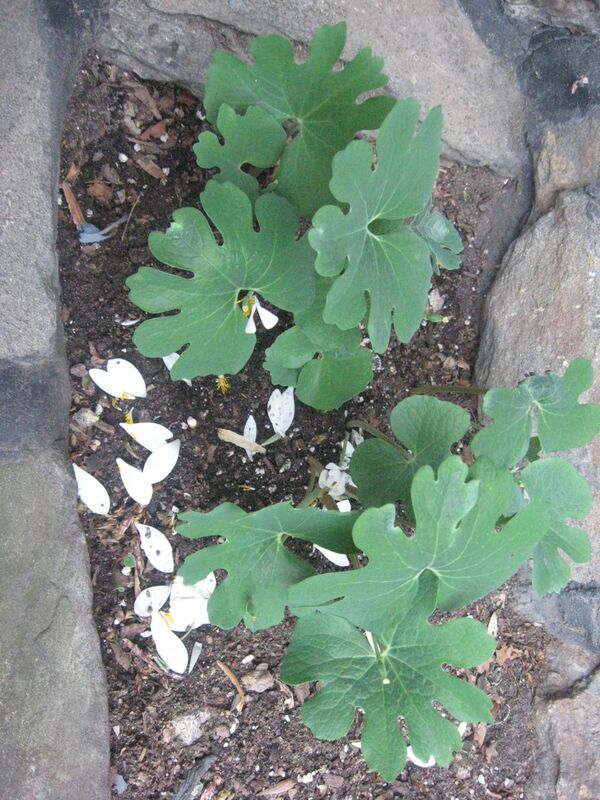 If it is a nice , very early Spring day, then the Bloodroot may be blooming! 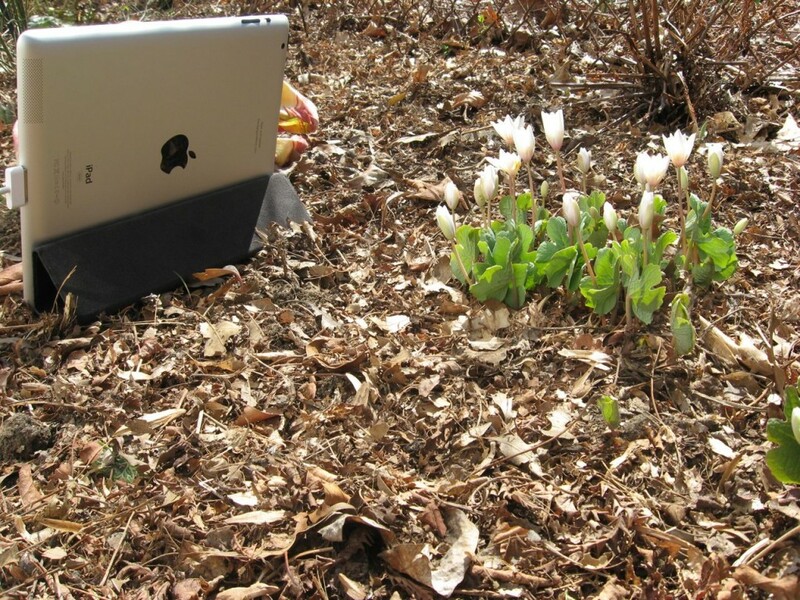 The I-Pad and I-Phone 5 were busy recording the blooming flowers on just one sunny, bright, early spring afternoon. The bundled tablecloth cloth was the extra insurance needed against a sudden wind or toppling of the Ipad onto the adjacent rock. That would be an unfortunate mess! And then the flowers were gone, the petals scattered about the dirt below, signifying the end of the very early spring. 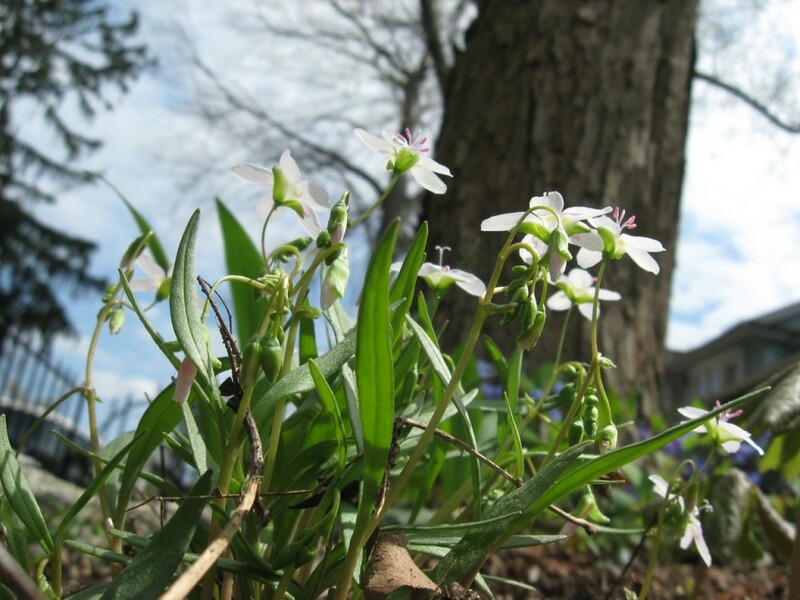 We very much enjoyed the Spring Beauties (Claytonia virginica) that grew and bloomed in our garden! Spring Beauty is a great garden plant, creating pleasing and serene early spring white flowers that last for a few weeks. 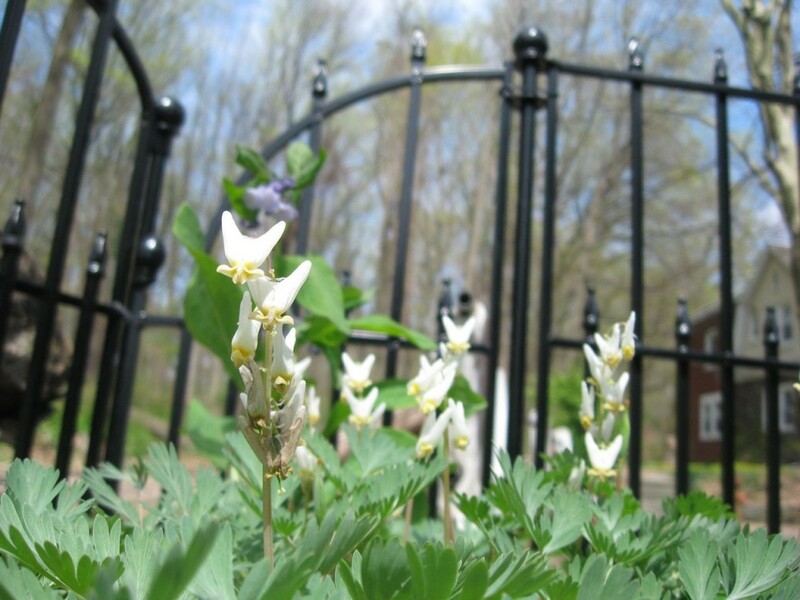 This picture above is all new material: This is the first time that the Dutchman’s Breeches we planted three years ago has bloomed in such a robust manner! Also new is the garden fence, which we installed to keep off-leash dogs from trampling our plants, as well as discourage browsing deer from eating them. So far, this has been wildly successful, as well as an elegant solution. As some neighbors have noted, it is very French as well. Christmas fern unfurls amidst the fronds of last year. Always a pleasant scene in the Early Spring! 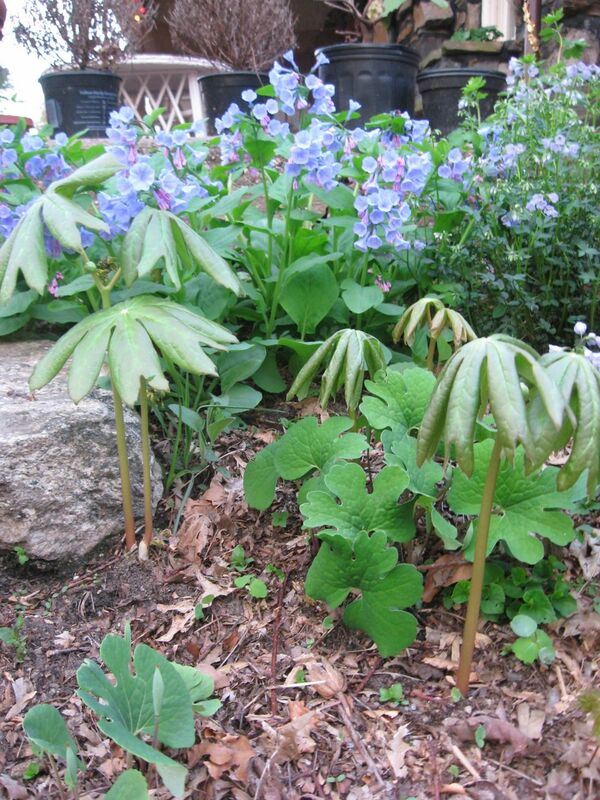 And this, above is the most fabulous Early Spring garden combo: Mayapples, Bloodroot Bluebells and Jacob’s Ladder. These next two shots are the last Bluebells we will sing praises of and display for you, this year, 2013. This Spring has been the most fantastic Bluebell year for us so far, in our Gardens and in our Spring adventures, the Bluebell has been the Spring thing. 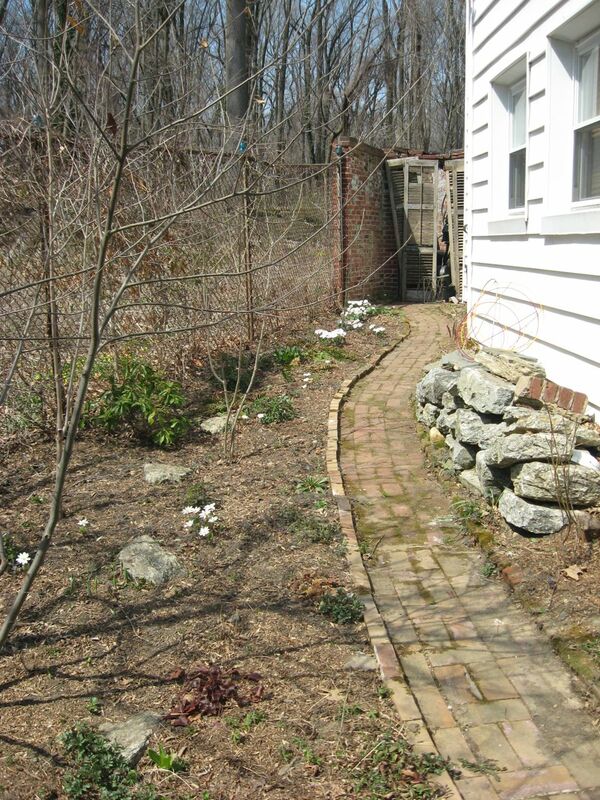 This Early Spring retrospective written in the last days of Late Spring would not be complete without showing off our garden Trilliums. Shenks Ferry Wildflower Preserve anyone? Could this picture have been taken at Shenk’s Ferry Wildflower Preserve or what? 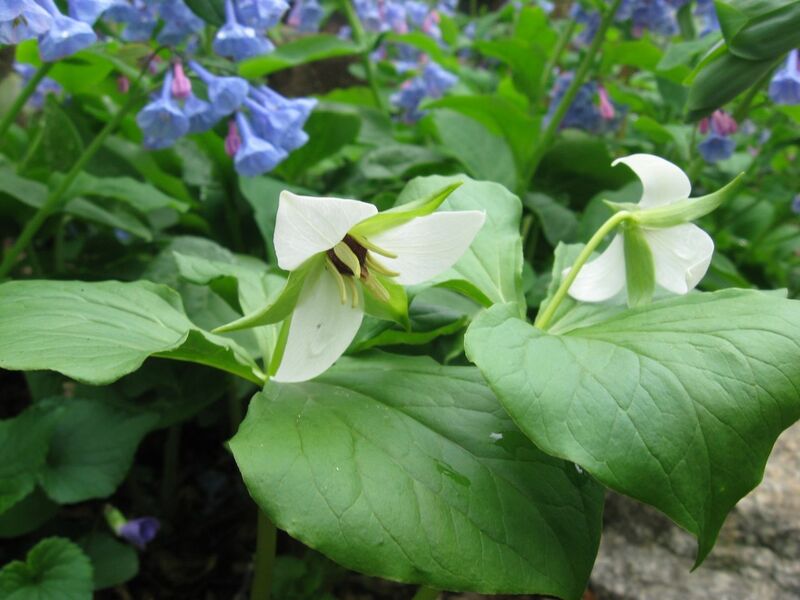 Trillium Erectum v. album with Mertensia virginica, the Bluebell is such the Shenks Ferry scene. These nursery -propagated specimens are now re-seeding themselves in our gardens, just like at Shenks Ferry. 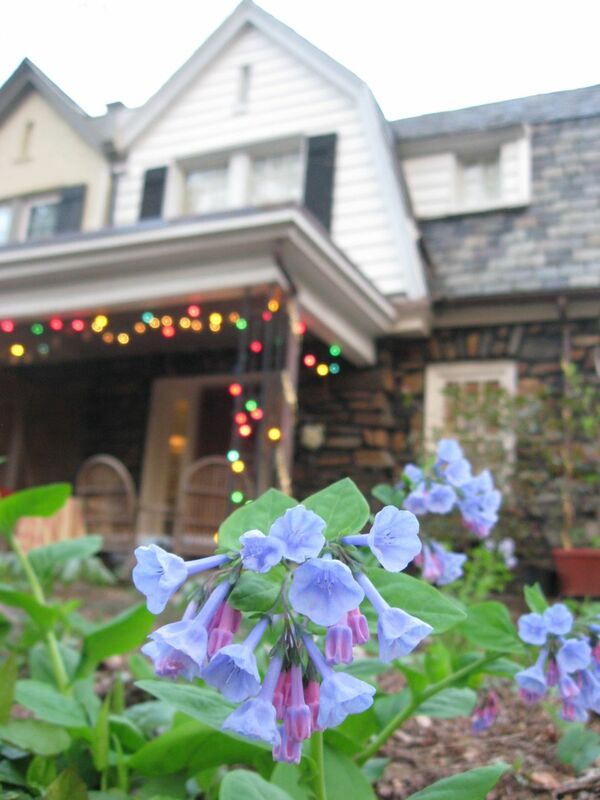 And this brings us to the last thematic of Early Spring 2013: how our urban yards can be transformed into the reality of some of the most vibrantly beautiful natural areas we can dream of visiting on a beautiful balmy Spring day. And if you have lots of room in a rural or suburban yard, imagine how many of these same plants can become larger, more comprehensive swaths of natural beauty, so much so that you may be happier staying home, (away from the traffic and crowds looking for nature in the decreasing remnant natural areas) because you are mesmerized by the beauty of your own yard!